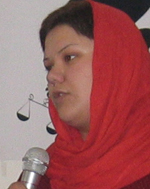 Delaram Ali, woman’s rights defender, appeared in the 15th District of the Revolutionary Courts, in Tehran on Monday July 2, 2007, following a summons to court. In court, Delaram was handed a sentence for her participation in the peaceful gathering of women’s rights defenders in June 2006, in Hafte Tir Square, which ended with police violence and brutality and the arrest of 70 protesters. While in court, Delaram Ali was allowed to view her sentence and copy by hand the verdict for her own records. Delaram Ali, who is a women’s rights activist and student and a member of the One Million Signatures Campaign, was sentenced for her participation in this peaceful protest to 2 years and 10 months prison term (which must be served in full) and 10 lashes. The sentence issued by Judge Salavati, in charge of the 15th District of the Revolutionary Courts, relied on ammendments 500, 610 and 618 of the Penal Code finding Delaram guilty of propaganda against the state, sentencing her to a six month prison term, participation in the June 12th protest, sentencing her to a two-year prison term, and disruption of public order sentencing her to a 4 month prison term and 10 lashes. This sentence which totals 2 years and 10 months jail term and 10 lashes, was commuted to this woman’s rights defender at a time, when similar cases against other women’s rights defenders charged in relation to the June 2006 protest, have received much lighter sentences. This disparity in sentencing demonstrates lack of unity among the courts and judges in treatment of women’s rights activists. The verdict issued by the court in the case of Delaram Ali, based its findings on a report by the Tehran Branch of the Intelligence Ministry, which claimed that Ms. Ali was guilty of the charges against her, and found her to be a "criminal". Such skewed findings by courts, influenced by the conspiracy and security oriented perspective of Intellegence officials, not only undermines and brings into question the independence of the court system and judiciary, but threatens the concepts of democracy and respect for human and civil rights. Additionally, failure to officially recognize civil action, by viewing civil activists as "criminals" and forcing women’s rights defenders to endure lashings or state sanctioned physical torture, is in fact the most contradictory and most illegitimate aspect of the sentence issued in the case of Delaram. 7) Bahareh Hedayat: 2 years suspended sentence. Sentences for Maryam Zia, Nasim Soltan Beigi, and Alieh Eghdam doost, also defendants in the June 12, 2006 protest in Hafte Tir Square have yet to be issued. It should be noted that suspended sentences are in fact subject to implementation if the defendant is found guilty of any crime in the course of 5 years following the sentence. In this way, the courts and intelligence ministry aim to isolate activists and make them inactive in the social realm.